Alyssa Carlier | The Devil Orders Takeout: Can there be TOO MUCH diversity in one book? (I say ... maybe.) Also, not the point. Can there be TOO MUCH diversity in one book? (I say ... maybe.) Also, not the point. Okay, okay, don't throw pineapples at me yet. If you know me, I am a huge diversity advocate, but let me discuss for a moment. More than a moment, because this post is super detailed. BUT I want to hear your thoughts afterwards! ETA August 2018 -- this post was written quite some time ago and my views have evolved since then. I hope to elaborate more on this topic someday, but please view it critically in the time being. Also, you should join my giveaway for a diverse book. Go ahead and tap "LATEST GIVEAWAY" at the top of your page -- it's my treat! 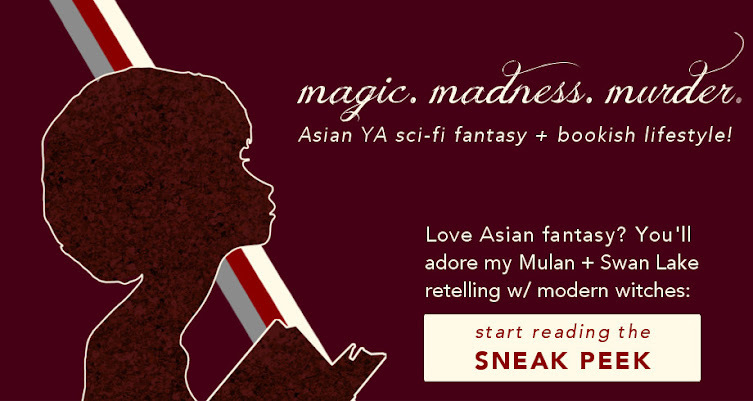 The other day, I was planning rewrites for my witchy WIP (read some of this Mulan + Swan Lake retelling here.) This is one of my more experimental novels, with structural and narrative techniques and just. everything. 1. There is always space for more diversity. Yes, everyone and their cousin and their delivery guy is talking about #WeNeedDiverseBooks. And I cannot articulate how much fandom has changed these years. Back in 2010, I wasn't in the blookunity, but I lurked in the Harry Potter fandom. Fast forward to 2016, and now I can see how wonderfully diverse everyone's fanfictions, fanart, fancasts, and even the canon adaptations are! And gosh, most of the books I read then were white male cis narratives, and now? THE OPTIONS SEEM TO BE ENDLESS. So I don't want to ignore the steps that the industry has taken! But the fact remains that diversity is growing fastest in contemporary, and there's still a lack of it in many other genres like fantasy, or dystopian, or thrillers. And even then ... a lot of the diversity doesn't seem to be enough. Diverse characters need to be in more central plotlines and in more plotlines in general. So it didn't make any sense to me initially why I'd want to take away the diverse plotlines. Because (1) I liked them. A LOT. (2) they are necessary to change the narratives available to readers. Let's be honest, so many of my childhood favourites are books about white people, and even though I enjoyed them perfectly well, I never saw myself in them. It's only in recent years that I've begun to see a more diverse range of books, and guess what? I enjoy diverse books so much more. Considering that I am too frightened of the outside world to leave for more than mini quests to the supermarket, I'm going to live prancing around with a book instead. I joined the blookunity just as #WeNeedDiverseBooks was gaining traction, and this is the most wonderful adventure I've ever taken in my life. So it seems absolutely ridiculous to actually reduce the amount of diversity in any novel. 2. Intersectional stories are so very important. When we refer to "lots" of diversity, it's not only a great number of diverse characters — this also includes when one character has multiple diverse experiences. Also called, from Tumblr knowledge, intersectionality. Let's put it this way: a white deaf person would face certain difficulties from their disability. But a black deaf person would face difficulties from their disability + prejudice because of their race. Intersectionality is my favourite thing to read and write! Don't get me wrong, it's GREAT if a character is Jewish or trans or suffers from a chronic illness, but it makes me three times more excited if they are all these things at once. Because their story is about 3000 times more interesting and I hear it 3000 times less. On that note, intersectional narratives are even rarer in YA than diverse narratives, and therefore they are needed for the same reason. 3. Said intersectional stories are realistic. Most of us don't have only one diverse experience. Our lives are basically many experiences intertwined together, and for many of us, more than of these are diverse. We're not a blank mainstream character + one diverse experience = a diverse character! Yay! The point of diversity is to be realistic. #WeNeedDiverseBooks is a movement to stop catering only to the privileged, but to everyone in the real world. And intersectional stories exist in the real world, and there is absolutely zero reason to avoid them. Intersectional narratives are basically diverse narratives taken to the next level. The values towards supporting intersectional narratives — representation, realism, so on — are the same as diverse narratives, and they need to be validated. Too much diversity seems to be a fallacy. Roll your cursor over the image to tweet or pin it, blookunity! But does fiction have to be realistic? Is there a point to which realism means poor storytelling, and even the best of intentions to portray diversity mean portraying it poorly? 4. The subplots for diversity take time away from the main plot. I'm referring to books where the main plot is not about the diverse experience, aka most non-contemporary diverse books. Which are also genres where diversity is lacking. Which just makes for a less stellar story in general. 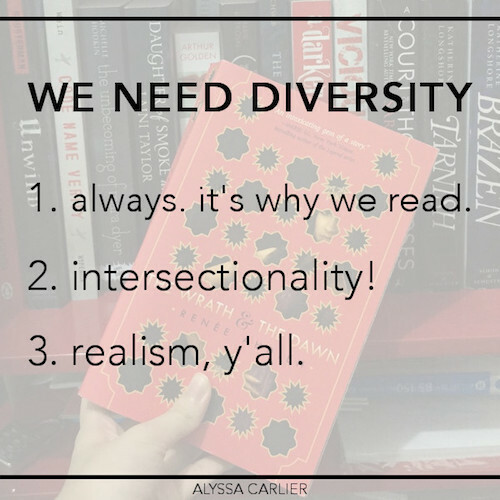 And let's be honest, we won't pick up books JUST because they include diverse narratives — there are so many fantastic books with diverse narratives that diversity cannot (and should not be) a selling point. Diverse stories need to be good stories first, or they won't resonate with the reader and undercuts the effect of diverse representation. So if the main plot needs to be addressed, the other option is to just kind of mention all the diverse subplots. Look, an asexual person in their natural habitat at the end of page 83! And over there, a wild Pokemon appears! Wait, wrong fandom. If the diverse subplots are only there for the sake of it ... I'm not convinced. It's totally cool to have diverse tertiary characters, but it's diverse representation, not diverse mention. Diversity needs the centre stage sometimes, and if the programme overruns, that makes it less valuable as representation. 5. The subplots for diversity take time away from each other. Sure, so we'll take time to explore the diversity ... but diverse characters need character arcs, and if there are multiple diverse experiences, then probably there are multiple character arcs to be developed. Even if the main plot is not compromised, overstuffing a book with diversity means that the diverse subplots will take time away from each other. And that's going to be unfair to one or both or all of those narratives. Another interesting thing is that many diversity discussions indicate that a single instance of diversity often doesn't satisfy readers. For example, many people ask diverse writing help Tumblrs what if my villain is agender? what if my f/f romance ends in tragedy? The answer, 99% of the time, is: better include another diverse character/relationship. While I absolutely think it's feasible to include several diverse narratives in a book — I also think if a book has so many narratives that none of them are properly explored, then as the blookunity so often calls it, the diversity becomes "checking boxes off a list" even if it didn't start off that way. You'll notice that both of my points are about diverse subplots needing time and attention. Because I believe that diverse representation is important — but plain representation is not enough. A narrative where we say, "Oh, and by the way, there's a black character who experiences racism over there, and a genderqueer character who faces family pressure, and a character who is living with disabilities down the street, and also—" means that we rob these diverse narratives of the time and attention they deserve. To be clear: I don't think there is enough diversity in the fiction industry. I think there can be a line where so much diversity is in one single book, whatever the author's intentions, it becomes token diversity. And that's not okay, because diversity in a book isn't just about avoiding stereotypes, but exploring them. The takeaway from this post? Is not that we need less diversity. My main point here is that we should stop talking about the "quantity" of diversity. Does it matter if a book includes ALLLLL the diverse experiences? Let's start talking about well-explored diversity instead. Blookunity! 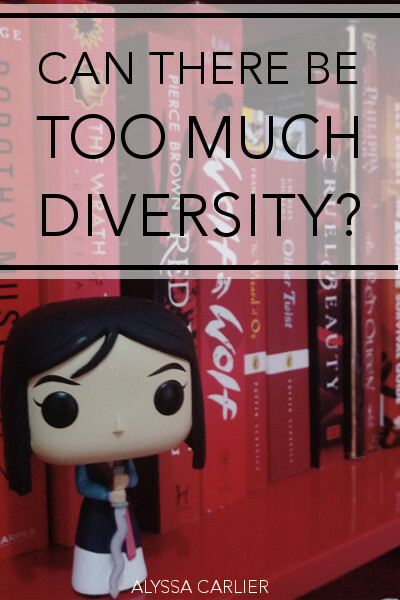 Do you think books can have TOO MUCH diversity? 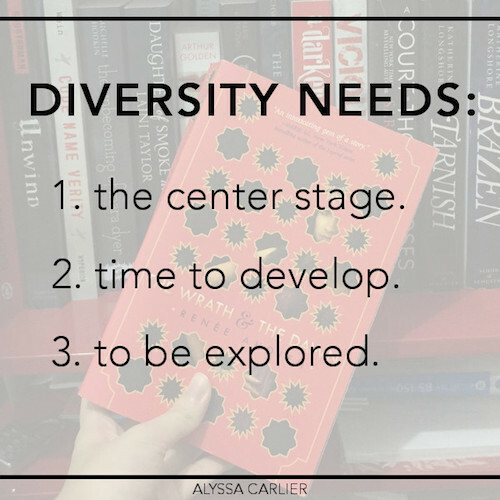 Have you read books with token diversity where you wish more time had been taken to explore said diversity? And oh! Recommend me your favourite diverse book!